What? Why are we doing a post on a one shop store or truck? Well because it’s so unique and good. Ono in Hawaiian mean delicious. Find more Hawaiian pidgin phrases here and you can figure out why Hawaiian say ‘shoots’ so much. Well, shoots I’m assuming ‘Yo’ means yogurt – pretty safe assumption. So pretty cool name – good so far. But, it still a frickin’ truck. If the yogurt is so good why do they put the yogurt shop in a strip mall like everyone else? 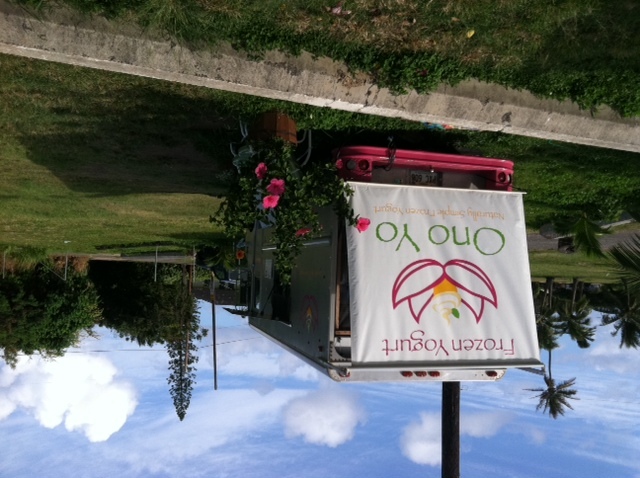 Who knows but Hawaii has a lot of good food served out of trucks: Giovanni’s Shrimp, Malasada Donuts, and some good Thai foot in Haleiwa. Yes, the yogurt is pretty good. It’s a liquid based yogurt with a sugar sweetener. 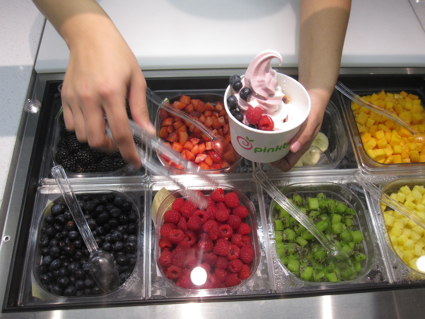 That is exactly why it tastes like Pinkberry. They also use a liquid base and sugar. Although I believe Pinkberry has a better consistency or perhaps the truck wasn’t producing enough power to freeze the yogurt cool enough. Today I tried the lilikoi (passion fruit) and it was excellent. Ono Yo is the only frozen yogurt store that I know of that uses fresh fruit in their mix – not a powder, concentrate, or puree. I believe it was the best tasting flavor of any yogurt I have tasted. Here are the ingredients for the plain yogurt. The fruit flavored ingredients are similar but the fruit is usually the first ingredient listed: nonfat milk, nonfat yogurt (skim milk, with live and active cultures (L. Bulgaricus, S. Thermophilus, L. Acidophilus), yoghurt powder (nonfat powder, nonfat milk powder, sugar, acidifier, citric acid, stabilizers (guar gum, carrageenan, fatty acid), and purified water. 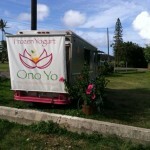 Go visit, it’s a fun adventure to sit outside a food truck in the warm Hawaiian sun. The owner is from Brazil and is interesting to chat with.